Follow-up to this previous thread. But now i will be posting only results for Africans with confirmed ethnic background within Africa. Unlike for New Worlders these results can therefore be verified with known genealogy. Should be insightful on how reliable/predictive the various AncestryDNA categories can be and also how they might be interpreted. Given that the Euro breakdown on Ancestry still gets some criticism i was very curious to know how the African breakdown would stand up for someone who can actually verify it. But they didn't do bad at all for this one. Of course it's not exact science (and perhaps never can be) but I'm just blown away by how the %'s seem to be pretty much in line even with this person's 1 non-Ivorian great grandparent who is Krio, the descendants of ex-slaves from the US, marroons from Jamaica as well as liberated slaves from all parts of West/Central Africa being settled in Freetown. It 's known many of them were Yoruba so some minor Nigeria would fit well. The Trace regions might also be explained by the very divers Krio background but it could also just be noise, as the confidence level is lower than for the main regions. Judging from this 1 single result the Ivory Coast-Ghana category seems to be VERY solid at least for someone of Ivorian descent . No one from the New Worlders got such a high score for a single category (relative to total African). They put down 83% but according to the range given it could be as high as 94%. According to this screenshot Ancestry performs 40 separate estimates and 83% would be the average of these 40 runs with 94% not even per se being the highest estimate. So that's a pretty tight range as well. 83% is also pretty much the same as the 86% scored by the "typical native" from Ivory Coast/Ghana according to AncestryDNA. This 86% being the median result of their 115 samples. 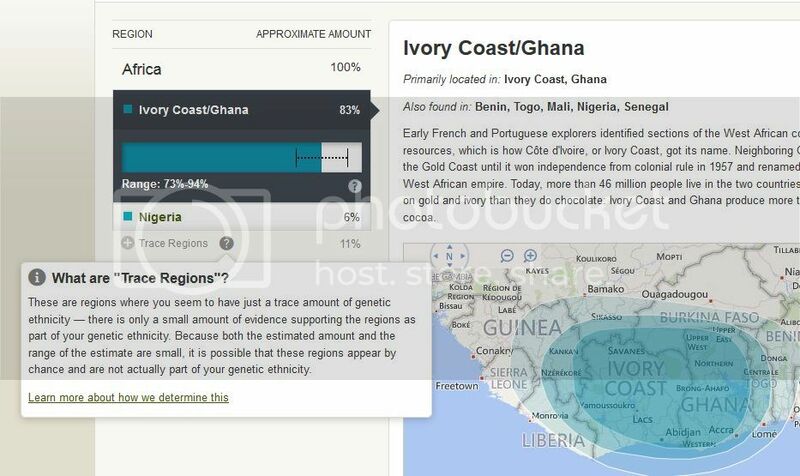 Perhaps for some Ghanaians there might be a pull towards Benin/Togo as Ancestry themselves has shown there's overlap between their samples for these 2 categories. But not so for this Ivorian. I suspect mostly Akan samples were used for the Ivory Coast/Ghana category. But i've not seen it confirmed yet. Interestingly this person's partial Malinké/Mandingo ancestry is not getting picked up in a separate category, like Senegal or the more weakly defined Mali category. So who knows they might actually also have used some northern Ivorians of Malinké background as samples. Still many of the Ivorian/Ghanaian samples used by Ancestry do score some noticeable Benin/Togo or Mali. In this screenshot below you can see how much these additional components would be on average. They should have picked less tricky colours lol, but from what i'm seeing the additional regions for Ivorians/Ghanaians would be about 10% Benin/Togo and somewhat less than 5% Mali while the other regions are at noise level. Last edited by Don Felipe; 04-18-2015 at 10:03 AM. The results might appear to be off at first look for those not accustomed to how AncestryDNA works. So i will also provide some background info to make more sense of the outcome for this individual. Most important thing to keep in mind is DON'T take the labeling of the categories too literally! They merely signal close genetic similarity to samples from the countries/regions after which the categories get named, they are NOT per se indicative of actual recent origins from those countries/regions! Most African countries have dozens of ethnic groups and interethnic mixing has been going on since prehistorical times. So ancestral clusters won't respect national borders drawn by colonial powers! Personally I have a feeling they correlate much more with the big language subgroups within the Niger/Congo language family but even so people speaking the same or related languages might still have divergent DNA profiles because we all have unique genealogies which transcend ethnicity if you go back in (pre)history far enough and consider such things as language shifts, absorption of marginalized aboriginal populations by newcomers but also recent migration etc. etc. Here's the Nigeria category description by Ancestry showcasing the individual variation which includes scoring %'s of neigbouring regions and also how Nigeria is relatively less predictive than all the other categories except Mali. Not very surprising given that Nigeria is the most diverse and populous country of Africa. Notice that among the 67 samples used by Ancestry there's one Nigerian with the exact same "Nigerian" score as this Igbo. But a "typical native" of Nigeria would have 69% (=median of the sample group). It's too early to jump to any conclusions yet but I have a feeling that other Igbo's will also tend to score less "Nigeria" and more "Cameroon/Congo" than the average of Ancestry's samples which probably also includes some Yoruba's while the Benin/Togo might vary more wildly. From the last screenshot in my OP i'm seeing Nigeria's additional components on average being first Benin/Togo then Cameroon/Congo (yellow), the other regions seem minimal but third comes Mali (light beige) and fourth SE Bantu. I anticipated for Igbo's to score some additional Cameroon/Congo as i had already seen it on persons of half Igbo, half AA background. It makes sense given the geographical proximity and the Bantu expansion which is supposed to have started in the border area of Cameroon/Nigeria. Mali, Senegal and SE Bantu being tiny Trace regions at noise level is also to be expected. But the 17% Benin/Togo (and 8% Ivory Coast /Ghana) is more surprising given that the Igbo's are located in southeastern Nigeria, bordering Cameroon, while it is the Yoruba's from southwestern Nigeria who are bordering Benin. It's tempting to correlate this finding with the commonly held belief that the Gbe speakers (Fon, Ewe etc.) of Benin/Togo were migrants from somewhere in southern Nigeria around the same time (1200's-1400's) the expansion took place of the famous Bini/Edo empire (confusingly also called Benin, but centered in southern Nigeria!). The exact extent of this empire is not known but i've read accounts that it stretched all the way west beyond Lagos into modernday Benin and it may also have caused population displacement in the east across the Niger delta into Igbo land. All this movement of peoples might possibly be the cause why an Igbo may have DNA markers in common with people from Benin/Togo and even Ghana (possibly Ewe mixed samples?). It would in fact be shared DNA that originated in Nigeria and still exists there but nowadays is more frequently seen in Benin/Togo. An even more fascinating hypothesis but more speculative is that aside from historical migrations there might also have been more ancient prehistorical movements of people between Nigeria and Benin/Togo/Ghana which explain why an eastern Nigerian would have DNA markers in common with people from countries to the west of Nigeria. I'm talking about the flow of people that would have been involved with the spread of agriculture within West Africa and more specifically the Yam cultivation. This map shows it well. Mali & Nigeria can be considered the two major ancient centers of civilization within West African history, both of them located nearby the extremes of the Niger river. Both with distinct agricultural systems, different language groups and also separate influence/expansion zones. Last edited by Don Felipe; 04-18-2015 at 10:04 AM. Very interesting because aside from genuine Khoisan and Pygmy's no other population will probably get such high "Hunter Gatherer" %'s as the South African Coloureds. The African breakdown is pretty much equally divided between SE Bantu and these socalled "South Central Hunter Gather's". It's actually one of the most straighforward ancestral clusters, strictly based on Khoisan and Pygmy samples. Individuals from the Africa South-Central Hunter-Gatherers region are admixed, which means that when creating genetic ethnicity estimates for people native to this area, we frequently see similarities to DNA profiles from other nearby regions. We’ve found that approximately 86% of the typical South-Central Hunter-Gatherer’s DNA comes from this region. Central Africa extends from the Central African Republic at its north to Angola at its south. Southern Africa encompasses Namibia, South Africa, Botswana and Zimbabwe. While the majority of its population is now composed of Bantu peoples, Central Africa is also home to many Pygmy populations. Southern Africa was first peopled by Pygmies, San and Khoisan. These hunter-gatherer populations still live in this region today. Most New Worlders will score only very small %'s for it, typically below 5%. From what i've seen Puerto Ricans and Brazilians score highest relatively speaking (as % of total African). In most cases it will be an ancestral component inherited from Bantu speakers brought over to the Americas who already carried these markers in their own genome. More specifically it will be an indication of Congolese/Angolan ancestry i suppose. However obviously not so for this South African Coloured who are known to have very significant Khoisan ancestry The other half is made up of SE Bantu which is a very wideranging category as can be seen from the map below. For this South African Coloured person the SE Bantu would be genuine alright though. However it's most likely not South African Bantu (Xhosa, Zulu etc.) but rather Angolan, Mozambican or even from Madagascar, as these were the areas where the Dutch of the Cape Colony mainly got their slaves from (aside from Asia). It's too early to jump to any conclusions yet but I have a feeling that other Igbo's will also tend to score less "Nigeria" and more "Cameroon/Congo" than the average of Ancestry's samples which probably also includes some Yoruba's while the Benin/Togo might vary more wildly. Too early indeed This guy actually has a higher than average "Nigeria" score while his Cameroon/Congo is quite minor compared with the first result i showed ^Perhaps i shouldn't be speculating anymore...but could it be that this guy is from a region within Igboland that's more closely related to other Nigerian ethnic groups than the previous one? I have two new Yoruba results as well i will post later on. They both score lower "Nigeria" and (much) higher Benin/Togo than this Igbo. Last edited by Don Felipe; 04-18-2015 at 09:44 AM. Here's the results of a Nigerian Yoruba for contrast. Her Nigerian % is close to what a "typical native" would score according to the samples from Ancestry.com (69%). So that should pretty much be average. 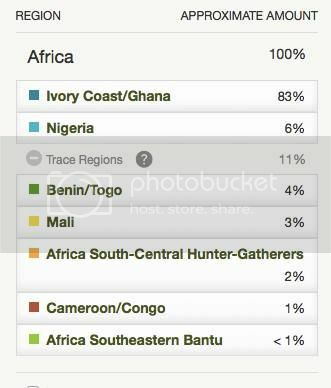 Also as expected the Benin/Togo % is quite pronounced, the Yoruba are afterall also to be found in Benin itself! Other ethnic groups from Benin, like the Fon, are also likely to be related genetically speaking as is usually the case for neighbouring ethnicities all over the world. I've actually seen the results of another Yoruba person and he scores even higher for "Benin/Togo": 52%! Again confirmation that these socalled "Benin/Togo" ancestral markers seen among New Worlders might just as well have been inherited via a Nigerian ancestor. When we get results in of Ghanaian persons they could also be scoring significant "Benin/Togo" %'s depending on their ethnic background. Everything else is at minor Trace Region level so could as well be simply "noise" or just generic DNA that's difficult to classify. Still interesting that Cameroon/Congo is mentioned only as a very reduced %, the Cameroon/Congo category could be a tell-tale sign i suppose to distinguish the more archetypical Yoruba from the averaged out Igbo, however it's important to stress that even within ethnic groups you will find MUCH individual variation. Benin’s largest ethnic group is the Fon (39%), followed by the Adja (15%), Yoruba (12%) and Bariba (9%). Togo’s largest ethnic groups are the Ewe (21%), Kabye (12%), Mina (3.2%) and Kotokoli (3.2%). Benin has more ethnic ties to its neighbor Nigeria; Togo has more links to Ghana. These ethnic ties are the result of long-standing kingdoms that flourished before European colonists created new borders. Many people in Togo and Benin speak one of about 20 related Gbe languages. Linguistic evidence indicates that most of the Gbe people came from the east in several migrations between the 10th and 15th centuries. 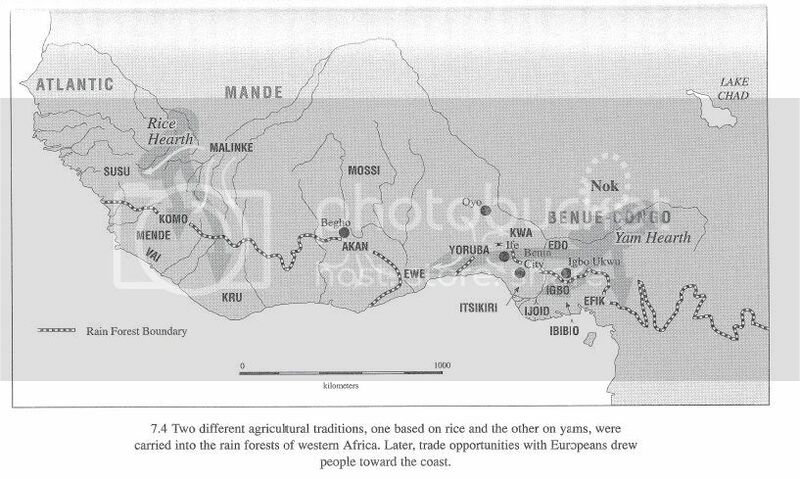 The Gbe were pushed westward during a series of wars with the Yoruba people of Nigeria, then settled in Tado on the Mono River (in present-day Togo). Last edited by Don Felipe; 01-09-2015 at 11:34 PM. Two Horner results, basically showing a combination of SE Bantu, North African and Middle East. No doubt SE Bantu became the default SSA category for Horners because in absence of a category based on Nilotic (Maasai) samples it will be the least distant SSA cluster for them on Ancestry. It won't be actual Bantu ancestry of course . The Trace regions have lower confidence level but still interesting what's being shown for the first result. Mali & Senegal are most likely the least distant SSA clusters after SE Bantu while the 3% Hunter-Gatherers might be hinting at the very ancient Horner connection with the Khoi-San?? Over the last several millennia the Sahara has been a significant geographic barrier for the people of Africa. Although trade routes between the northern and southern parts of the continent have long existed, northern Africa has been strongly influenced by people of the Middle East and southern Europe. Probably the cradle of modern humans, Eastern Africa spans from Ethiopia to Mozambique and Madagascar. Eastern Africa harbors an incredible genetic diversity, with Ethiopia alone containing dozens of ethnic groups. Home of the famous Maasai people, the southern part of Eastern Africa was first inhabited by Khoisan hunter-gatherers, until they were replaced during the Bantu expansion. Last edited by Don Felipe; 01-20-2015 at 06:13 PM. I would like to emphasize from the start i do not have any certainty about the ethnic/regional origins behind these results for this biracial person. So posting these results in this thread is based on (informed) speculation on my part However i think combining the unusually high SE Bantu score on Ancestry's test and the 23andme composition of the same person showing a minor but hefty amount of East African (hardly ever present among New Worlders except for miniscule amounts below 1%) it seems to be highly suggestive of recent East African background. Not Northeast African because there's also much West African showing up and no North African. Here's the AncestryDNA breakdown, it's the highest absolute level of SE Bantu i've seen and also relative to total African it's among the highest, 55% of total African (27/49). Dominicans and Puerto Ricans can also score high for this category from what i've seen but their total SSA was lower than 35% in those cases. I highly suspect black or pardo Brazilians could also score comparable levels of SE Bantu, but i have yet to see their results. Otherwise it's only genuine Africans who've scored this high for SE Bantu. Already posted in this thread, the coloured person from South Africa and the Horners. So like the name suggests and also the map is showing the Southeast Bantu category can signal very wideranging ancestral origins for different people, much depending on their nationality i suppose. If this person's African background is indeed from either Kenya, Tanzania or Ruanda/Burundi, it's interesting to note that the minor Cameroon/Congo and Nigeria being shown possibly might hint at shared ancestry between these countries having to with the Bantu migrations originating in southeast Nigeria and moving via Cameroon/Congo to East Africa. 23andme for the same person, notice 10,1% East African! A couple of East African 23andme results to show how the East African category is coming up for them, noticeable for all but very varied in between about 10% and 90%, no doubt because of different ethnic backgrounds. The "West African" %'s can be explained again by the Bantu migration but also because of 23andme's choice to include Kenyan (Luhya) & Bantu samples for this category, despite them being East African ... AncestryDNA has shown that subregional resolution, incl. a separate Bantu category is in fact very much possible. Expanding from Senegal to Nigeria, West Africa composes about a fifth of the African continent. West African have a long shared history, and was united by large empires such as the Ghana Empire, dating as far back as the eighth century AD. Other empires later succeeded, making Western Africa a region of strong common heritage. Last edited by Don Felipe; 01-20-2015 at 09:14 PM. Very cool thread! Thanks for sharing. Will You Take the AncestryDNA Test?